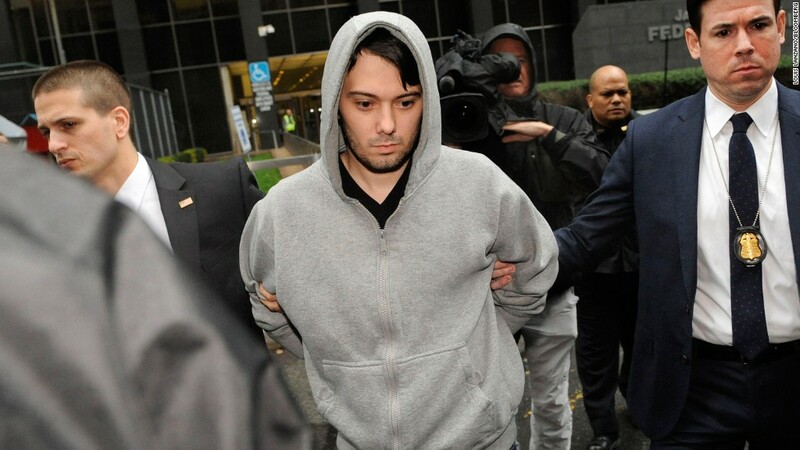 Martin Shkreli says he was arrested last week because he hiked the price of a life-saving drug by more then 5,000%, not because of financial misdeeds alleged in his federal indictments. In an interview Sunday afternoon with The Wall Street Journal, Shkreli insisted that federal prosecutors were only going after him because of the drug price hike which led to the media dubbing him "the most hated man in America," and presidential candidate Bernie Sanders calling him the "poster child of greed." "'Trying to find anything we could to stop him,' was the attitude of the government," Shkreli said, according to the Journal story Monday. "Beating the person up and then trying to find the merits to make up for it -- I would have hoped the government wouldn't take that kind of approach." He again insisted that he would be found not guilty of the securities fraud and conspiracy charges he now faces, charges for which he can be sentenced to 20 years if convicted. He remains free on a $5 million bond. U.S. Attorney Robert Capers said at a press conference after Shkreli's arrest that the drug price hike played no role in the investigation of the charges against him. Capers said the probe began in 2014 when Shkreli was still CEO of Retrophin, a separate drug company which fired him more than a year ago. Retrophin and federal prosecutors both accuse Shkreli of essentially stealing company assets and stocks to compensate allegedly swindled investors in two troubled hedge funds. Capers said he ran Retrophin and the hedge funds like a Ponzi scheme and a personal piggy bank. FBI official Diego Rodriguez said the charges represent "a securities fraud trifecta of lies, deceit, and greed." The Journal reported that Shkreli gave the interviewed flanked by his attorneys. He insisted statements made about him by authorities after the arrest are not backed up by the indictments themselves. Shkreli said the arrest was "because of a social experiment and teasing people over the Internet"
"That seems like a real injustice," he said. "Quite frankly, it was not something I expected, and definitely not something I deserve given the facts." Since his arrest, Shkreli has quit Turing Pharmaceuticals, the company at which he raised the price of the drug Daraprim, a move that catapulted him into the public eye. He's also remained active on social media, live streaming hours of his more mundane activities, such as playing chess and talking on the phone, and tweeting claims of innocence. Shkreli's Twitter account was hacked Sunday, and someone changed the name on the profile to "Martin The God."